Home / Posts Tagged "run"
The impact we had on others during this race was an unexpected, flattering, and emotional surprise for all of us. What started as a silly joke to laugh at ourselves ended up encouraging others around us through our humor and energy. It was never about getting a medal for our group. It was about the laughs. And I’m glad we were able to bring that to so many others. The kind words from everyone, the many posts online of and about us, and the overwhelmingly positive response made our decision to continue this idea next year and beyond an easy one. So I just recently returned from Orlando where I competed in the DisneyWorld Princess Half Marathon. I know a lot of people laughed when I said I would be doing a race that was such a short distance, and also a Disney race. For those who don’t know me, I’ve never been big on the idea of “Pay to Run” (by myself). And the races I have started to compete in recently are 140 mile Ironman triathlons – I have three Iron races I’m doing later this year, actually. The reason I’ve never been keen on paying to run is because I don’t feel like going and running a race by myself just to get a medal, and my newer hobby of triathlons is ridiculously expensive. But as an ex-cast-member the appeal of doing a Disney race with my old lifeguard buddies was still there. 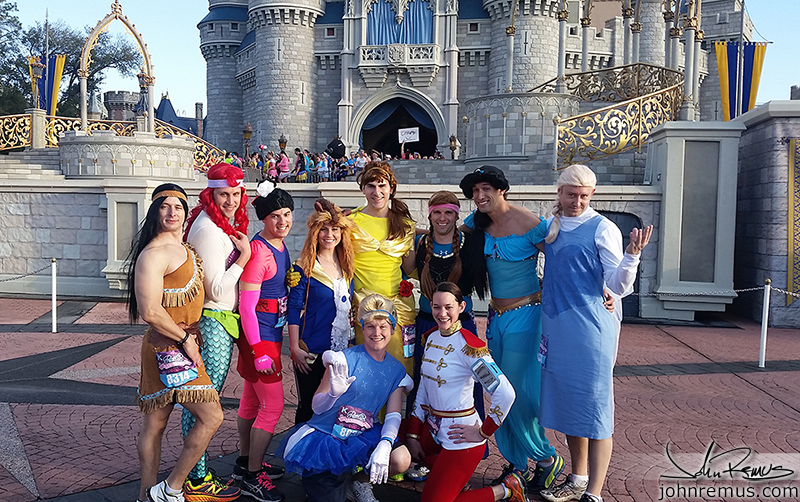 Click the break to read more about our experience as #PrincessMen at runDisney’s Princess Half Marathon!